How to Get Rid of Spit Bubbles! 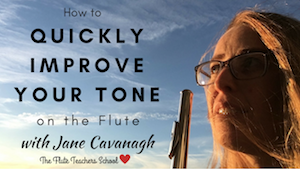 In this video, learn the fastest way to get rid of annoying leaky condensation in the keys of your flute. Are you sick of sluggish, unclear, or slow TONGUING? Well, you're in luck. I've just made you a video which will help! Have you been wondering how to properly play TRILLS on the flute? Exactly what a TRILL is. Is it Possible to Play HIGH NOTES with the Same EASE as Lower Notes? You might remember a few weeks ago, I sent an email to you asking what you really still wanted to know about how to play the flute better? Do you know how to align a flute head joint properly? If you ever hear (or feel) THROAT NOISES when you play the flute, then this video is for you! If you're wondering what brand of flute I play, here's a guided tour of my flute!